Fortunino Matania was an Italian-born artist who created historical illustrations for the English magazines of the World War 1 era. 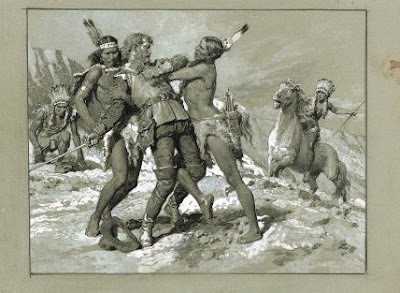 Here's a picture he did of Captain John Smith captured by Indians. 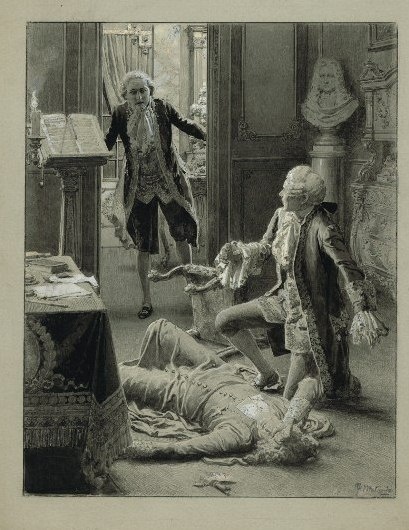 Matania often rendered his pictures on a gray-colored board, which allowed him to develop the darks in pencil and ink wash, and to add the white areas with white gouache. 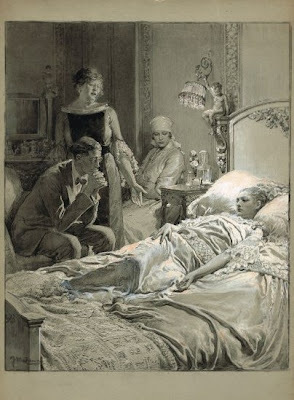 The bright white of the pillow behind the sick girl really glows, and the solid black of the standing woman's dress provides an eye-catching shape behind the seated man. This one is called "Cagliostro: The Law of Trane" from Britannia & Eve. The tone paper technique is helpful for developing compositional sketches or for creating relatively quick renderings of complex scenes. These images are all from the collection of Anthony Smith, who is offering them for sale on his Pinterest page. Thanks, Anthony. This is very impressive work. Almost 3D in effect. I nearly referred to the pieces as monochrome, but I suppose that technically, with the warm-toned paper, there are three "colors" employed. Either way, the craftsmanship is stunning. Excellent craftsmanship; especially the silks and clothing -- however I can't get past the first image was completely historically wrong -- he dressed the Native Americans like the Sioux and Western/Plains Peoples -- There where NO HORSES during that scene -- the Powhatan and Algonquin didn't use horses (Europeans brought them to American). But he is an excellent artist however. Stunning draughtsmanship, I suppose the 3 tone style was dictated by printing technology of the early 20th century? I've seen some equally impressive 2 tone paintings by Heath Robinson using just ultramarine and crimson. i've recently got into painting and drawing on grey cereal packets and supermarket pizza boxes. its thick enough that it doesn't wrinkle up so you can work quite wet. and its cheap so you can play about and don't feel like your going to muck up you best art materials.also working from dark to mid and then mid to light like this helps you think about tone differently than working on white paper.